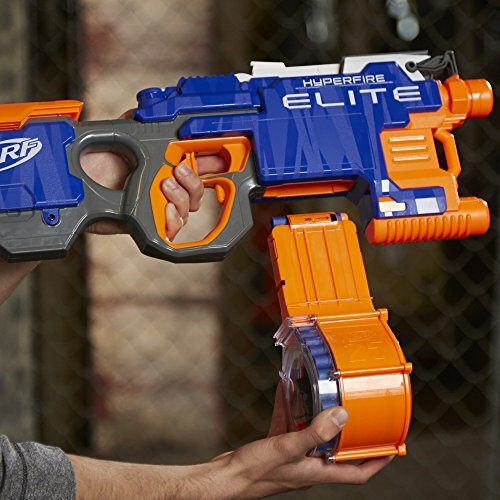 The 2016 Nerf N-Strike Elite Hyperfire is a full auto blaster with an impressive 25 dart drum and 5 darts per second firing rate. But is the new Nerf Hyperfire really as good as it looks? This is our review of the Nerf Hyperfire and its main features. When we first saw the Hyperfire, we got somewhat excited as this gun does look very decent with a great color scheme. While the Hyperfire is not officially the successor of the Nerf Rapidstrike CS-18, one can’t help but compare the two. The biggest difference between the two blasters is that the Hyperfire uses a conveyor belt mechanism whereas the Rapidstrike uses a traditional motorized pusher. Disappointing? We’ll see. We instantly liked the overall design of the Hyperfire, maybe because it looked so different from other models. The first thing you’ll notice is its big front which you could argue looks a bit clunky, but we actually like it. The drawback is that this doesn’t make the gun very ergonomic. While the round part of the grip is somewhat comfortable, the front grip actually sits really low. Some love it, others don’t, it’s a matter of personal taste. Also, when the 25 dart drum is attached it can actually get a bit in the way of your wrist which can be annoying for some. On this, the drum can be very easily attached and detached with one simple click. The handle of the gun overall is well-designed and comfortable enough. There are three holes, one for the thumb, one for the index finger and another one for the rest of your fingers. The thumb hole is big enough but can get a bit annoying after playing for a longer period of time as your thumb keeps pressing against the edges. The clip release button and rev trigger sit in the biggest hole and can be easily controlled by the middle finger. The Hyperfire has a lot of sling points, sharp edges, angles and all sorts of things going on which, overall, gives it a bit of a weird sci-fi look, especially with the oversized front-end. Unlike the front, the stock at the back is actually quite small. An awkward design, but somehow we like it. What we also like is the color scheme. The combination of white, orange, blue and dark gray works really well. The size of the Hyperfire is perfect, not too big and certainly not too small. It must be said though that with the batteries installed, it feels a bit heavy at the back. As mentioned, the Hyperfire uses a conveyor belt mechanism that lives inside the jam door. As a safety measure, the blaster is disabled by a switch when the jam door lock is open. The conveyor belt can be activated by clicking the rev button. To achieve that impressive 5 darts per second firing rate, simply keep the primary trigger pressed with your index finger. With 25 darts you’ll have the drum emptied within 5 seconds. Pretty cool! To avoid running our of darts so quickly, you can simply fire in smaller bursts. An issue that should be pointed out is that the jam door cannot be fully opened, which in our opinion is a little design flaw. This can be annoying when you have to fix any jams that may occur, and trust us, they will occur. And with a jam door only half opened. resolving jam issues can get a bit tedious. Let’s get straight to the point, the firing range is a bit disappointing when using rapid fire. The box claims you can hit 90 feet (27 meters), but 30-40 feet is more realistic. It’s a known fact that range suffers when using rapid fire, but we were hoping this blaster would still be able to perform better in this regard. Point it at an angle and you’ll get better results though. Similarly, the accuracy is also not that great when using rapid fire. The Hyperfire requires 4 D batteries that need to be installed in the battery tray in the stock. As mentioned, this makes the blaster feel a touch heavy at the back, but with the front being so big, the weight of the batteries actually create some balance. The batteries are not included. Check out our list of best Nerf guns ever made. Overall we like the Hyperfire but it’s not as awesome as we hoped it would be, or maybe our expectations were a bit too high. The firing rate is superb, and we love the design of the blaster, although the low grip at the front is something that needs time to get used to. We are not too impressed with the range and accuracy, especially when using rapid fire. Overall though, this is still a great blaster that can be further improved with some modifications here and there.